Square Enix is keeping the train that is Final Fantasy XIII moving full steam ahead. The latest licensed product based on Final Fantasy XIII is unique, yet incredibly functional if you happen to need one. Lightning and Odin will be keeping an eye over, of all things, your card collection come later this year. 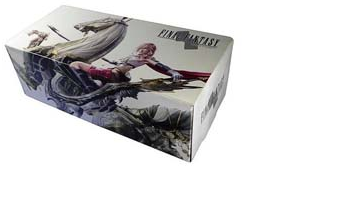 Square Enix is releasing a card storage box with the beautiful artwork of Lightning and Odin draped over the entire front of the box. The storage box is designed to hold, in total, 400 cards. While the cards Square Enix has in mind are likely those from their own Trading Card Game, the dimensions of the box will support anything from baseball to football cards which isn’t too shabby. The storage box ships flat, but when assembled measures 9.44 x 4.33 x 3.34″. No absolute date has been set, but pre-orders have its arrival in late September. If you’re a card collector or just have some old cards lying around and you like Final Fantasy why not store them in style?